The geographer and conservation ecologist, Distinguished Professor Jamie Kirkpatrick, measures his success by the new things he discovers that allow us to better protect the natural world, and by how much they are used to do so. He has been awarded the Eureka Prize for Environmental Research and an Order of Australia for service to forest and world heritage conservation. If human beings had not started burning fossil fuels, and destroying the forests of the world, the earth would be sliding into yet another glacial period. The warmth, wetness and acidity we have created through this clearance and combustion is one of the many ways we threaten the rest of nature. Yet our numbers and our impact continue to increase. How can we ensure that natural diversity outlasts fossil fuels to enrich the future? Jamie has made answering this question his life's work. In 1983 Jamie wrote a paper, the first in a large field, on a method for optimising areas for reservation. This paper and later work have given him an international profile in conservation planning. He has advised government and non-government organisations on policies and strategies that have contributed to improving the Australian reserve system, protected area management practices and species conservation. Conservation of natural areas is not the only focus of Jamie's research. He is also interested in maintaining nature in our farms, production forests and gardens. But, Jamie says, the reality is that the best educated and richest people surround themselves with nature, because they can afford it, while the urban poor make do with a view of the sky. He believes that humans may be happier and healthier when they're in touch with nature. This is certainly the case with Jamie, who spends much of each year measuring nature in the wild with his many undergraduate and postgraduate students. His beloved garden has more than 400 plant species; all are endemic to planet earth, some support or are threatened species, and some he eats. Jamie is a Distinguished Professor working in Geography and Spatial Sciences. He focuses his research, and that of his many students, on topics relevant to the improvement of nature conservation in its broadest sense. His work to this end spans ecology, pedology, geomorphology, climatology, political geography, social geography and cultural geography. He also does research that amuses him. He has found that such pure research sometimes proves helpful for nature conservation, sometimes not. Jamie became a lecturer in Geography at the University of Tasmania in the early 1970s after a few years as both types of demonstrator at the University of Melbourne. He has been based at Sandy Bay since, apart from six month sojourns in Fiji and California in the 1970s. He was appointed Professor in Geography and Environmental Studies in 1988 and a Distinguished Professor in 2009. He has been Head of various academic units for almost two decades at various stages of his career. At the University level, he developed the environment and wilderness theme and a degree in natural environment and wilderness studies. He has been a member of many influential government and non-government committees in the area of nature conservation. 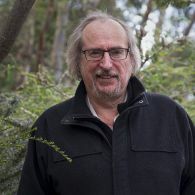 In 2003 he was made a Member of the Order of Australia for his research and implementation work on world heritage and forest conservation, which continues. Expertise in all modes of teaching and teaching development honed over four and a half decades. Jamie is frequently asked to give plenary addresses, which he usually does if they are in Australia. The more frequent form of invitation is to examine theses and referee papers, which he does a lot of, averaging one paper per fortnight and 3 theses per year. Jamie and his group do work that is relevant to all of the university themes, although some more directly than others. The overall motive is to contribute to nature conservation, a task that takes many paths, and not ones that are necessarily predictable. He has had a strong recent publication record on the socio-ecology of the urban forest and the effects of firing grazing interactions on fire hazard and vegetation. Jamie has also been following up of monitoring plots in alpine and subantarctic environments established in the early 1980s by him and his students. 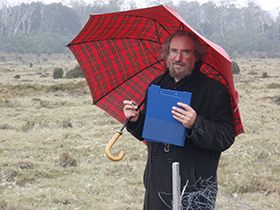 Since 2015, he has been doing more on the effects of native animals on soils, geomorphology and vegetation, and the social geography of recreation and a sense of place. The current (2017) PhD students who he actively supervises are working on: climate and vegetation change on Macquarie Island; native animal diggings; the effectiveness of local government in biodiversity conservation; saltmarsh ecology inventory and management; the conservation ecology of a rare butterfly species; shrub invasion in alpine ecosystems, farm dams and biodiversity; and palaeo-endemic invertebrates. Jamie collaborates with scientists in bureaucracies, non-government organisations and universities in Australia and many other countries. Dynamics and formation of alpine pond complexes. The dynamics of alpine rush circles. The ecosystem dynamics of alkaline pans in southwest Tasmania. Long term dynamics of string bogs at Mt Field. For some other projects to which he currently contributes see the 'Research Themes' section. Jamie has published more than 20 books and more than 270 refereed papers/book chapters, including 57 since 2010. He has an h-index of 41 (Google Scholar) and an i10-index of 184. Two thousand and one hundred of his 6221 citations have been since 2010, with many papers little-cited in the decade after publication being widely-cited recently, indicating that his research is well ahead of its time. His most-cited paper was the first in the field of heuristic conservation planning. His urban wildlife, fire and grassland publications are also highly cited. These grants were continuous from the mid 1980s until Jamie attained the age of 65. Since then, he has concentrated on important projects that are not attractive to funders. Determine the impacts of different fire regimes on woody plant invasion and native vascular plants. This project is the production of a 2-3 page synopsis of the socio-economic values of the Tasmanian Wilderness World Heritage Area. This project aims to significantly improve our understanding of the attitudes and behaviours of recreational vehicle (RV) users who choose to stay at free or low cost overnight locations. Urban trees are a vital element of the sustainability and liveability of cities. Anecdotal evidence suggests recent changes in the Australian urban tree estate. These changes are not well documented, nor are their causes and consequences well understood. Using a novel socio-ecological methodology, data from remote sensing, size class analysis, social surveying, focus groups and interviews will be integrated to understand the patterns and causes of tree retention, establishment and removal. On this basis, predictive models will be developed to aid in planning the optimisation of the urban tree estate. Jamie has always thought that if a prospective student thought that he would be a good supervisor for them, they are in the best position to know, and has believed that Masters and PhD thesis topics should reflect the interests of students, not those of the supervisor, although the supervisor should have relevant competence. He recognises that different people require different approaches to supervision, and tries to please. He won one of the first supervisor awards in the University of Tasmania, has graduated more than 50 PhD and Research Masters students, several of whom are now professors themselves, and has a large number now. He usually has one to three students commencing each year, so is open to highly-motivated new students. PhD Are Moorland Invertebrates Resilient to Fire?